School is back in session, and as I pack cold lunches each morning for my children, my main goal is to provide them with a good, healthy lunch! It is important for them to have a variety healthy foods to "feed" their minds, as well as their tummies, for their day of learning! I help in the lunch room at their elementary school and am often shocked and horrified by what some of these young children bring to school in their cold lunches. I think the most disturbing lunch included pop tarts, a full-sized candy bar, caramel popcorn, and a pop! I was recently asked to take the TruMoo lunchbox challenge with my children and I jumped at the opportunity. 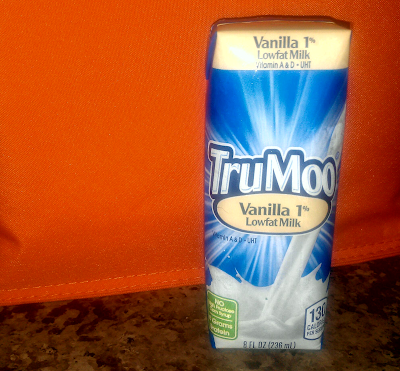 Since TruMoo shelf-stable milk does not require refrigeration - it's the perfect drink to send in my child's cold lunch. preservatives often found in juice drinks with the calcium, protein and vitamin D found in milk, all important for growing kids? My kids love milk - plain, chocolate, vanilla, strawberry, butterscotch, caramel... it doesn't matter! TruMoo milk is both delicious and nutritious! It is also rich, smooth and makes the perfect addition to their lunchbox or any meal! For parents on the go and on a budget, here are “Lunch Box 101 Tips & Tricks” from TruMoo Milk Boxes to help make lunchtime less stressful and more nutritious for their kids. 1. Instead of a juice drink pouch, opt for a flavored shelf-stable milk box, which provides all the benefits of milk including 8g of protein, Vitamins A and D, and calcium, without high fructose corn syrup or any artificial colors or flavors found in many juice drink pouches. TruMoo single serve milk boxes are a great option. They are available in three flavors kids will love – chocolate, vanilla and plain low-fat varieties, and are free of artificial colors and flavors. 2. Try to include at least one item from each of the five food groups: grains, vegetables, fruits, dairy and lean protein, to help ensure a balanced meal. 3. For a time-saver, sandwiches can be prepared the night before. Put sandwiches in reusable sandwich boxes instead of aluminum foil to prevent them from getting crushed or soggy. 4. Bite-sized fruits and vegetables are an easy way to add a nutritious and fun staple to lunch boxes. For picky eaters, a favorite dip like low-fat ranch, peanut butter or hummus can help make sure those fruits and veggies quickly disappear. 5. Choose leaner lunch meats like chicken, turkey, and tuna in water, or choose a hard-boiled egg, beans, or edamame as great protein alternatives. This way, kids can get protein with less fat and calories. 6. Keep cold food cold and hot food hot – keeping foods at safe temperatures will prevent the growth of unhealthy bacteria. Ice packs and insulated containers are key. 7. Instead of potato chips, try something different with the same amount of satisfying crunch such as: baby carrots, whole wheat pretzels without salt or baked sweet potato chips. 8. Liven up the lunchbox with fun-shaped sandwich and vegetable cutters. Lunchtime should be fun for kids, and they’ll be thrilled to find a butterfly- or dinosaur-shaped sandwich in their lunch. 9. Use leftovers, but change up the presentation by putting meat on whole wheat bread or pitas with sliced tomato or create a rice bowl with leftover veggies and protein. 10. Variety is key to keeping kids happy at lunchtime. Avoid boredom by offering new meal and snack options daily or weekly. TruMoo single serve milk boxes are available in three delicious flavors kids love – plain, vanilla and chocolate 1% lowfat varieties. Moms can feel good about giving their kids convenient, shelf-stable milk since TruMoo milk is free of artificial colors or flavors, and the milk used in TruMoo milk boxes is produced without the use of artificial growth hormones. School is back in session! 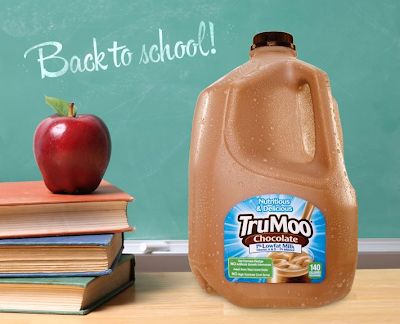 Let’s boost that brainpower with a big glass of TruMoo! It’s packed with vitamins and minerals, plus protein! This giveaway will end October 4th at Midnight EST. 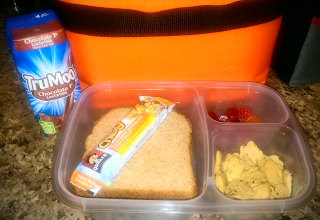 Disclaimer: The Being Frugal and Making it Work family received a complimentary TruMoo Back to School lunch box survival kit for the purpose of writing a review and hosting a giveaway. Regardless, I only recommend products or services I would use personally and/or believe will be a good fit for my readers. The views and opinions expressed on this blog are based purely by our own experiences. No monetary compensation was received. Results may vary. Strawberry Milk. Thanks for the review and giveaway! I want to try the coffee! My daughter would like the chocolate milk though. I would love to try the TroMoo chocolate milk. My girls LOVE chocolate milk and it would be great to pack in their lunches! I would always love the chocolate milk best, but I would also like to try the Strawberry milk. I would love to try the Chocolate Milk especially because it does not contain any high fructose corn syrup! 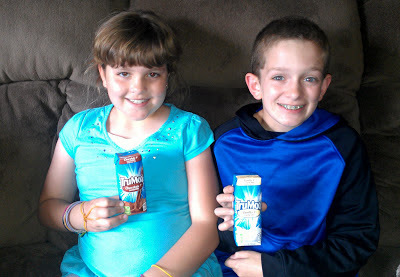 I would like to try the tru moo chocolate milk, it sounds yummy, and we love chocolate milk. Ooh, gotta try the Strawberry Milk! I would like to try the TruMoo chocolate milk. I definitely pack lunches the night before. Sandwiches, and everything else I pack, is fine overnight in the fridge and it saves me sanity and time! The coffee flavor sounds delish! My kids actually like coffee so that would be something we could all share without me giving them real coffee, haha. My favorite tip is "2. Try to include at least one item from each of the five food groups: grains, vegetables, fruits, dairy and lean protein, to help ensure a balanced meal." I do that all the time! I would like to try the strawberry, since its my favorite & I have never tried Trumoos Strawberry!